When three such influential and creative musicians work together it creates a great excitement with followers of Irish music and this has been very evident with the number of people that have flocked to see their performances over the last number of years. Dónal Lunny is founding member of bands such as Planxty, The Bothy Band, Moving Hearts and Coolfin. Dónal has been at the forefront of the evolution of traditional Irish music for more than thirty-five years and has participated within the renaissance of traditional Irish music in that time period. Pádraig Rynne is one of the most in demand musicians in Ireland at the moment. He is founding member of Guidewires and is involved in many ground-breaking projects of our modern era in Irish music. He has a number of recording credits to his name and is involved in many fusion projects. Sylvain Barou is Breton music’s finest. January 2012 saw the release of his first solo album and he is credited by many as having helped Breton music evolve further with his generation. He is also a founding member of Guidewires and has been working with the best known musicians in Brittany, Ireland and India for the last number of years. On this page you can find material required to promote a concert for the trio. If you require more information than is provided here please contact us. 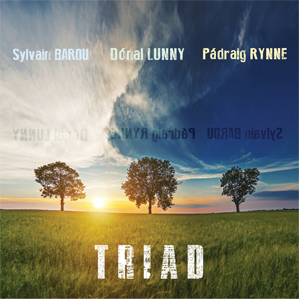 Pádraig Rynne, Sylvain Barou & Dónal Lunny- TRIAD OUT NOW! Dónal Lunny - Bouzouki, Guitar, Bodhrán, Percussion and Bass. Here are some friends sites and also some other projects we are involved in. BBC's Imeal Geal - 2012.